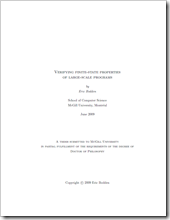 Over the holidays I was able to finalize my dissertation on “Verifying finite-state properties of large-scale programs”. It’s a great feeling to get this weight of my shoulders. 311 pages were not easy to manage in the end… Many thanks to everyone who contributed to the document, especially to Jan Sinscheck, who still found quite a few typos and misplaced commata in the end. The thesis will shortly be available through eScholarship@McGill and through ProQuest (as PDF and in print).